According to Graeme Bailey at the Gambling Times, Arsenal are hoping to win the race to sign Manchester United’s out-of-favour defender Luke Shaw this summer. Shaw has endured a nightmare time since joining United from Southampton in 2014 as his career stalled due to serious injury and he’s now fallen out with Jose Mourinho. There have been reports of bust-ups in training and Mourinho publicly criticised the left-back after hauling him off at half-time during United’s FA Cup win over Brighton last week. 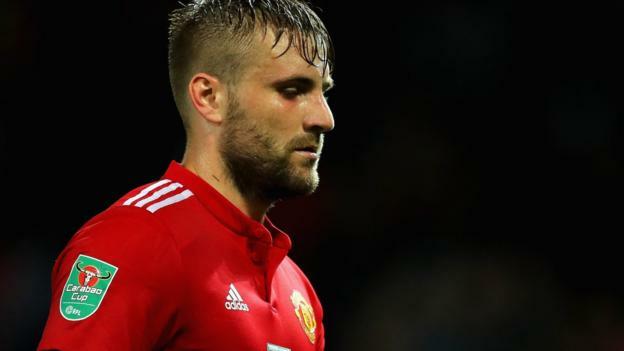 The Gambling Times claim that Shaw has been told he has no future at Old Trafford and the likes of Chelsea, Tottenham, Everton, Newcastle and former club Southampton have all expressed their interest. However, the report says Arsenal have now joined the chase for Shaw’s signature and are confident we can lure him to north London with the promise of a fresh start. The Gambling Times say our new head of recruitment, Sven Mislintat, believes Arsenal are the perfect club to rejuvenate Shaw’s career and he’s told his bosses to launch a move to sign the 22-year-old this summer. Despite the uncertainty surrounding Arsene Wenger’s future, Arsenal are still pressing ahead with their summer transfer plans and a new left-back to replace Nacho Monreal has been touted as a priority. Nacho has been one of our most consistent players in recent years but he’s 32 and with Sead Kolasinac failing to impress since joining from Schalke, it seems we’re on the look out for another left-back. Shaw was once regarded as one of the most exciting young full-backs in Europe so he’d be an excellent addition if we could get him back to the sort of form he showed during the early days of his career. However, there are concerns over his weight/diet and his attitude so his signing wouldn’t come without it’s risks. Plus, we’ll face stiff competition from several other Premier League clubs so I’m not getting too excited about Shaw joining Arsenal just yet.